Weld Purging is the act of removing oxygen from the vicinity of a weld before, during and after welding metals such as stainless steel, titanium, zirconium and nickel alloys. Without Weld Purging, the weld would be left oxidised and discoloured, which could then lead to loss of corrosion resistance and metallurgical imperfections. 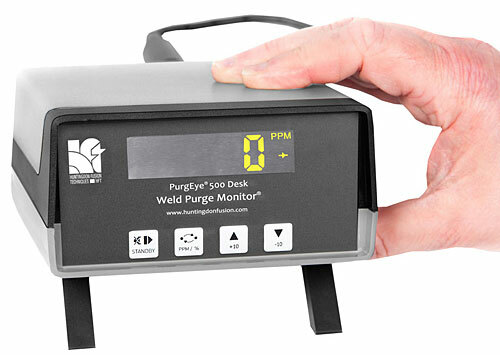 In order to accurately read the residual oxygen level inside a tube, pipe, welding chamber or enclosure during the act of purging, Weld Purging experts Huntingdon Fusion Techniques HFT® have designed a Family Range of Weld Purge Monitors to suit all applications and budgets. Their PurgEye® Desk launched this month, is ideal for use with Welding Chambers and Enclosures as well as Orbital Welding Machines and other Automatic Welding Systems. The PurgEye® Desk has automatic fault finding diagnostics, that can detect and report a number of possible faults and it also features an OLED (organic light emitting diode) display giving brighter, sharper readings at longer distances. This rugged, high frequency proof instrument measures oxygen levels from 1,000 down to 1 ppm (accurate to 10 ppm). The PurgEye® Desk has a unique, fast response, long-life sensor with little maintenance requirement. The Monitor comes complete with an integral pump to deliver the exhausting purge gas to the measuring sensor on a consistent basis to allow precision control of the welding systems. This Weld Purge Monitor® is particularly suitable for use in ultra clean conditions, such as in cryogenics, food and drinks, semi-conductor, aerospace, pharmaceutical sectors and any other process industries. The Weld Purge Monitor® was invented by HFT® in the 1970s and with over 40 years of innovation, design and manufacturing experience, the company now has a Family of PurgEye® Weld Purge Monitors® to measure oxygen levels from atmospheric content (20.94%) down to 1 ppm.